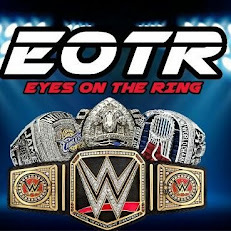 Some rivalries are born out of entertainment some are born because wrestlers are the best at that they do. 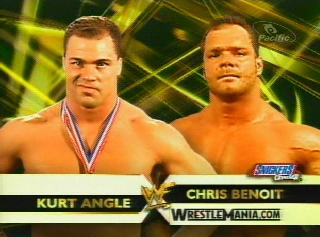 This week we will discuss one of the best rivalries ever in Kurt Angle vs Chris Benoit, where these two legends gave it all they head over a three year period. 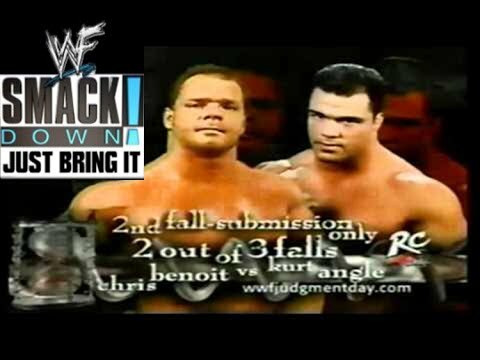 Two of the best wrestlers to ever lace up boots, you knew Kurt Angle and Benoit wasn’t going to disappoint from an in ring standpoint, but with the element of entertainment Kurt Angle brought it made for an even more entertaining rivalry. Whether it was about tapping out to a submission or their reluctant tag team, they would entertain the audience through the duration of their epic feud. It was tough to pinpoint a single match that was their best encounter, because there are so many, but this is the one we selected and I think most would agree that it's hard to argue against it. -Hands down their best encounter. This wasn’t about entertainment. This wasn’t about fun. This was about Angle being back on the mountaintop and Benoit wanting to win the title. These two went out and put on an absolute clinic. When you think of a wrestling clinic this is the match you show people, for a few reasons. For one, Angle showcased why he was one of the best. Two, Benoit had what would likely be considered his breakthrough performance, as the standing ovation he got after the match was huge, and set the tone for him to win the Rumble the very next season. There are so many matches we could reference as their best, as they have some classics on Smackdown, at Unforgiven 2002, Backlash 2001, and many others. This feud would spawn so many great matches that it would take up the entire article. There isn't a bad match in their feud at all. There are so many great matches that we figured we should list a couple of those, since there are no bad matches to speak of, only matches that were too short and mostly don't even count. Let's take a look at the underrated matches. -We were tempted to put their Unforgiven 2002 clash here in the first spot but this match was too good to ignore. You have to love every second of this. These two went out there and arguably had the best match of the night. It was simply fantastic. They never had a bad match as the two had excellent chemistry that can never be ignored, so with that being said, let's take a look at two more underrated matches in their feud. -Another match between these two technicians that showcased exactly what you expected. Angle and Benoit went at each other with everything they had and this match tends to get slept on just because it's a part of one of the greatest events in WWE history, and in my opinion, the greatest Wrestlemania ever. -The master of the Ankle Lock. The master of the Crossface. These two went at it in an often forgotten match that showed that both men were able to compete at the highest level for over 30 minutes. This match was fun, and even went to sudden death, where Benoit pulled out the win continuing his face turn and push. I honestly think that 2001 feud between Angle and Benoit is one of the best feuds in ring wise of the last 20 years. It was consistent top tier performances over and over again, and this match was another on the list. I would say Angle won barely, as the high profile matches saw him get the win, including Wrestlemania 17 and Judgment Day 2001, along with their best match, Royal Rumble 2003. Benoit got the victory at Unforgiven 2002 and Backlash 2001, but it seemed that Angle had his number. This feud would end up catapulting Benoit to the next level, pushing him to become a main event level star by the time it was finished, so in reality, no one really lost this feud. It's a classic feud that needs to be remembered and appreciated for years to come.